I am guest posting over at Shabby Art Boutique today making my Lavender Heart. Pop over and take a look they are super easy to make and make wonderful gifts all year round. Mmmmmm Lavender .... I lurve lavender :o). What a pretty little heart :o)!! What a delightful project. I'll pop over right now. How gorgeous Fee,make a lovely KK present. Thanx!!! Have a nice day! You've done a wonderful job at being guest blogger over at Kerryanne's Boutique. Thank you for the tutorial on such a sweet heart. 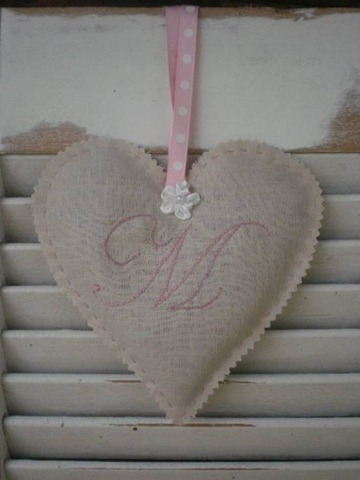 Such a sweet project Fee, I still have my special lavender heart swaying on the stand next to my desk! scented projects are the best. Thanks for sharing your wonderful tutorial! Thank you for the tutorial, Fee. Beautiful as always.Wish I was closer and could make the retreat in March. Alas, I am in Canada.